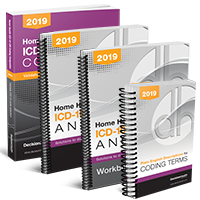 The 2019 editions of Home Health ICD-10-CM Coding Answers and Home Health ICD-10-CM Coding Companion are the perfect tools to use along with the Complete Home Health ICD-10-CM Diagnosis Coding Manual, 2019. When purchased separately, you pay $378, but when you order these two products together, you pay only $298, a $80 savings! 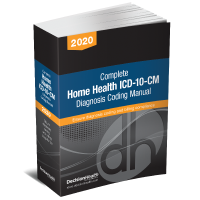 An instructional tool that mirrors each disease-specific chapter of your 2019 Complete Home Health ICD-10-CM Diagnosis Coding Manual. This is your guide to accurate coding and compliance with expert guidance and comprehensive decision trees to help coders navigate the ICD-10 code set and its guidelines. Packed with coding scenarios and their rationale, plus a BONUS plain-English guide of coding terms, this is the ideal resource to practice ICD-10 coding, increase accuracy and simplify coding. Work through 200 scenarios that cover home health’s most complicated situations, including surgical and trauma wounds, late effects, neoplasms and much more!